Decibel ensemble laid down the challenge to French (predominantly) electronic composers to create music for acoustic instruments. 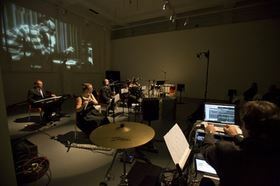 The result was a concert of essentially acoustic music informed by electronic ideas. OCCAM OCEAN HEXA II co-written by Eliane Radigue and Carol Robinson was premiered by Decibel last year. I can see why the group chose to give the work another outing. It is a subtle, gentle and intense work which opens inaudibly – the occasional scratching from a cello bow scratching across a string tailpiece. As the volume gradually increased the performers (cello, percussion, viola, flute and clarinet) used alternative fingerings to mis-pitch notes making clouds of overtones that hummed, hovered and moved incrementally, without any electronic effects. It was both soothing and unsettling; an incredibly simple concept and a completely otherworldly experience. Two works by Lionel Marchetti explored the interactions between a performer and a loudspeaker. In Une serie de reflets a clarinet note was heard through a speaker and echoed by the live clarinettist, the sounds blending into a drone. The same idea was applied to harmonica, bass flute and various other instruments. The performers swapped instruments based on directions from Iphones but otherwise they improvised their interactions without a score. The electronic sounds grew increasingly dark and a low string drone became the foundation for a piece of immense musical architecture that included a percussive tapping from the piano while flute and clarinet wove micro sounds above. The resulting hymn-like scaffolding seemed simultaneously fluid and stationary. A stunning world premiere of a work that deserves to become a signature Decibel piece. Marchetti’s Premiere etude (les ombres), first performed by Decibel in 2012, felt a little gimmicky following on from this. The work was built around intentionally imperfect imitation creating a discordant duet between the instrumentalist and the loudspeaker. The sounds were birdlike, mechanical and often unsubtle. For some reason the simplicity of the idea didn’t translate to a significant aural experience, despite the efforts of the ever-professional Decibel ensemble. This review copyright The West Australian 2016.